I'm planning to build a personal art project using multiple monitors. I'm not sure if I'll do this in Windows 7 or 8. Not having infinite wall space in my house, I want to make a photo gallery using multiple 24" monitors, that can either cycle through groups of pictures or have certain collection fixed for a while. Screen savers are random things, while I want curated list. 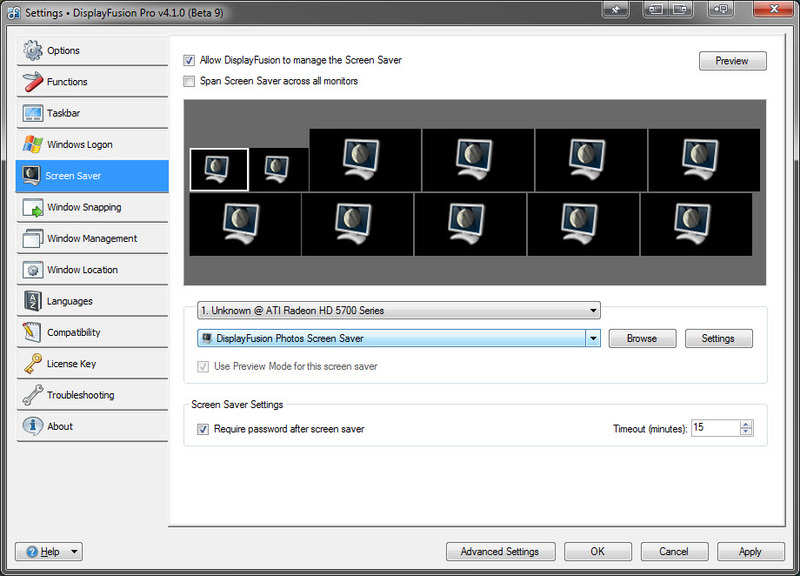 Each photo is assigned a monitor, and all monitors change together to the next collection of pictures. Can I do this with your existing software, is this a forthcoming feature and/or do I need to program this myself? Ideally, I'd love to have this controlled by a tablet that normally sits on the wall, giving information about each picture the way a museum display would, but it could be used in wifi mode to allow somone on a couch to browse through collections of images. Note I don't want that interface to allow somone to create collections, that's to be done elsewhere and when. @Dave: That sounds like a very interesting project! 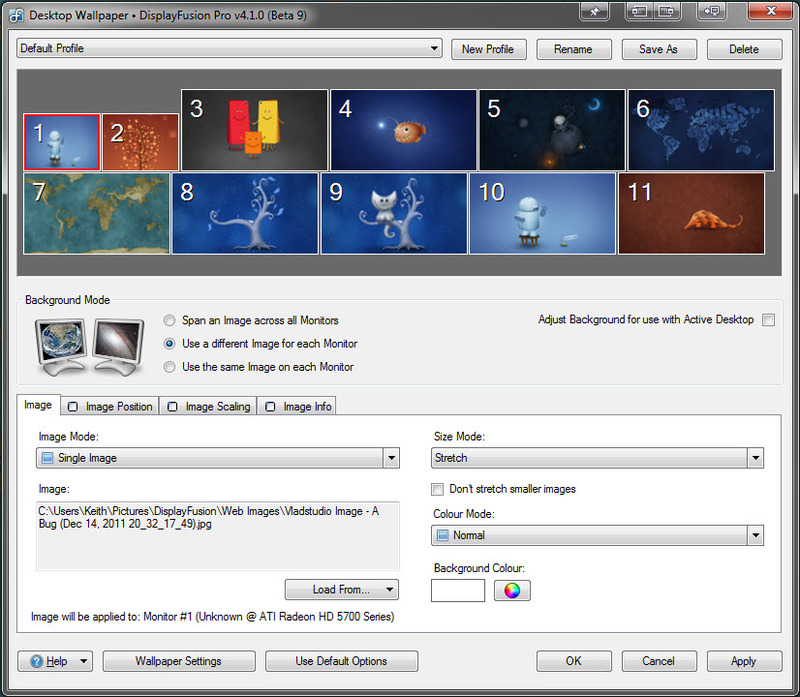 With DisplayFusion, you can have each monitor display different images from a folder of images. Each monitor can use the same folder, or a different one, and they can be synced to change at the same time or different intervals. The only part it can't do is the remote tablet control. If you had your computer and the primary monitor in a different room, you could manage DisplayFusion from there without anyone seeing what you're doing. If you'd like more in-depth assistance, drop us a line at support@displayfusion.com. I would like to know, if i can display different application on different screens. I have a laptop and 3 monitors. I want to work on the laptop and see different live application on each screens. I have an AMD Radeon HD 6870 video card, with 2 digital ports, 1 HDMI port, and 2 mini-ports. For now, exclude both mini-ports, which supports 3 monitors per port (supposedly if using a monitor hub). Hence, I would like to utilize the remaining ports for three monitors instead of the 2-monitor default limitation. As indicated, therefore, by comments in your first paragraph, your program should be able to circumvent the 2-monitor limitation, thus allowing me to display said monitors concomitant of my video card. @Gary: Unfortunately that's a hardware limitation that cannot be worked around using software. I've updated the first paragraph to clarify that a bit better. I'd like more info on the use of a tablet, and the possibility of extending DF onto my laptop screen. @James: We'd be happy to provide more info. Could you email us with some more details on what you're looking to achieve? @J Powl: You can add additional video cards if your motherboard and power supply can support them. Alternatively, there are some cards that have 4 outputs (like the ATI FirePro cards), or you can certainly do USB video adapters (http://www.displaylink.com/shop/adapters), though they aren't good for gaming. I have 7 monitors in various sets/pairs, and sizes. These are setup as an MS Extended (contiguous) desktop even though most of the monitors aren't next to each other. 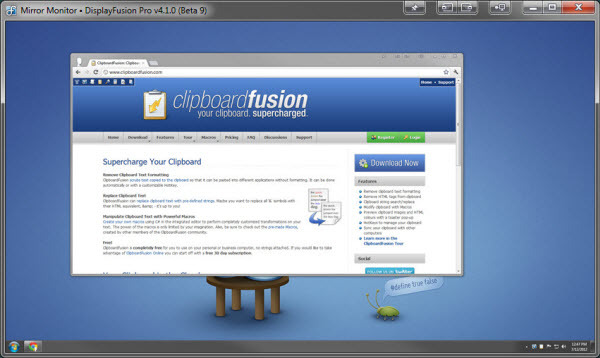 I would buy DisplayFusion in a heartbeat if I could have 2 large monitors use the same desktop image. Another 2 pair share a different desktop image. I'd like to have the other 3 small monitors each use a different desktop image suitable to their size. 1. What versions of Windows can ths Software run on ?? 2. Is it just for Windows 8 ?? 3. Is there a MAC version ?? while I wait for my 2 new monitors to arrive. DisplayFusion runs on Windows XP and higher. 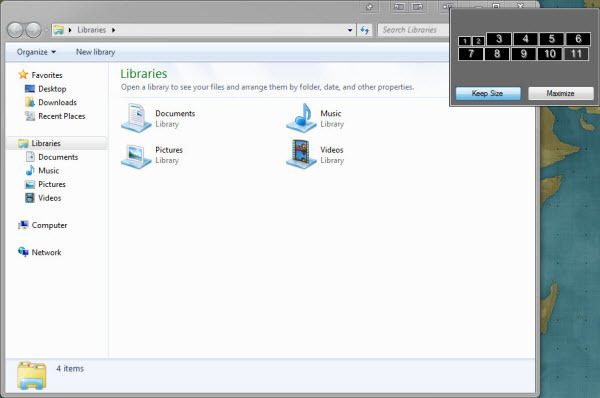 There are some Windows 8 specific tweaks, but all of the other features are available on the other versions of Windows. Hi, I was asked to redesign the news room of a TV channel. Can I use your system to combine screens to give the feel of a large monitor in the news room. I like to create a feel of media room using 4 monitors, playing the same image to give the feel of a large screen. One large Image. 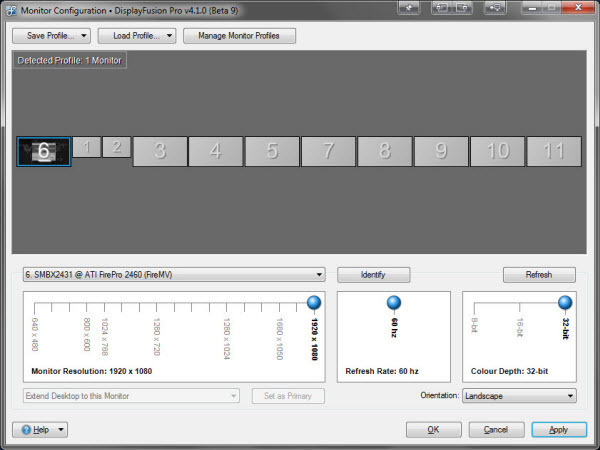 @Biju: DisplayFusion can't combine the displays into one large display. This is usually built-in to higher end models of newer video cards. Nvidia calls the technology "Nvidia Surround" and AMD calls theirs "Eyefinity." @Blaine: DisplayFusion works on Windows XP and up. 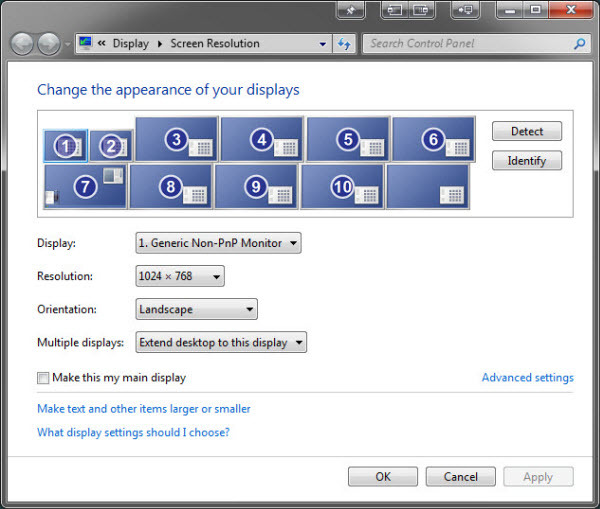 Note that your video card needs to support the number of monitors you're planning to use. can i split 1 display (led tv 42") for 4 software from my laptop with a VGA for PC connector? 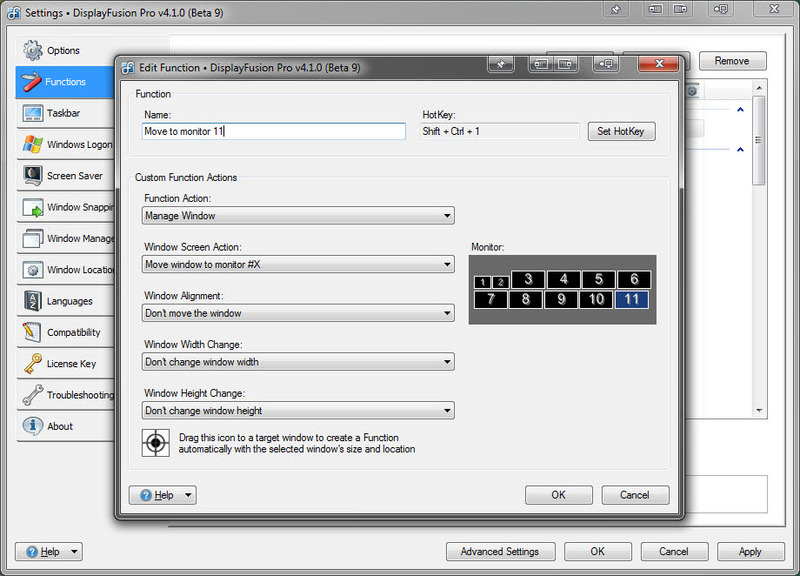 @shlomo: It's not possible to split full screen applications, but if they're just normal application windows, you should be able to do this by setting the Horizontal/Vertical split values to 2 in the DisplayFusion Monitor Configuration window. just to set value in the DisplayFusion... so that way i will get 4 app (like word or powerpoint) runng good(in 42" LED TV)? @shlomo: Word yes, PowerPoint no, as PowerPoint only allows one instance to be run at a time. 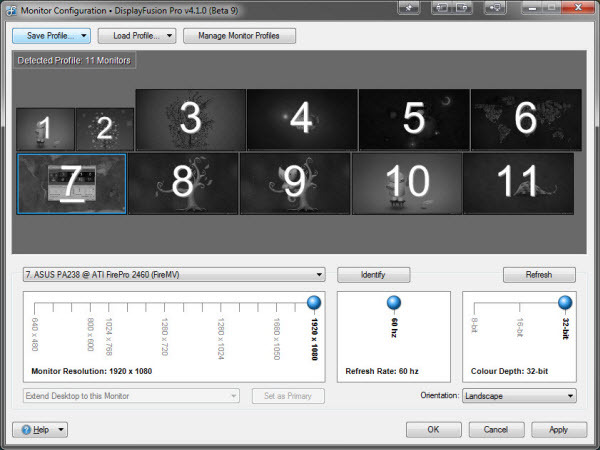 thanks for the help guys, does this work with the free version, or what version would work better for trying to split the pictures into 4-6 monitors, any feed back would be great! Hello, I have two monitors with different resolutions and dont want to use one resolution for both. Does Display Fusion have that capability? @Marco: You should be able to do this even without DisplayFusion if the monitors are in extended mode. If they are cloned, the resolution needs to be the same. 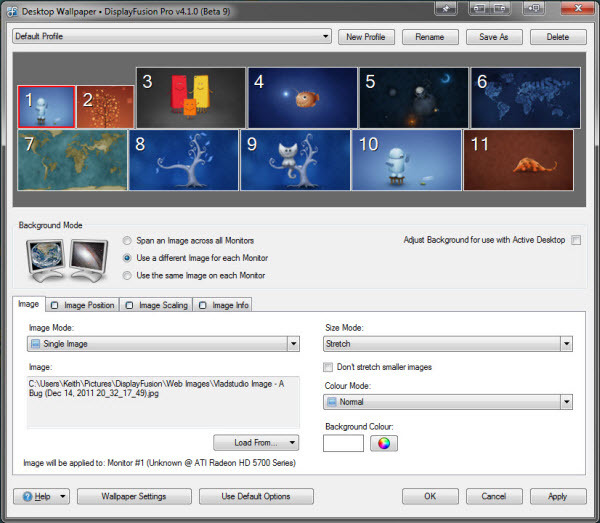 Hi - when using the software to manage 5 screens to display individual photos for customers - is it possible to display the file-name as well without the need to edit each photo with text? @Chris: It sure is! On the Info tab in the Wallpaper configuration, just enable the "Show info on this monitor" checkbox, then choose Wallpaper File Path and File Name from the "Add Info Tag" button. Could a vga splitter box be used to have multiple monitors? I have ASUS computer (Windows 8.1) with vga adapter connected to 32" led TV (1080p). And I have 4 USB HDMI Startech (ipusb2hd2) ip adapters with 1080p remote TVs. A can clone 3 remote TVs to vga monitor, but last one gives me an error and clone is not working (does not matter in what order I clone monitors - the last one - an error) I use latest free version, as I understand pro version has the same number of monitors support. Is the any fix for that?